Fans of homebrewing will enjoy a weekend learning the art of brewing ginger beer, as practiced in the 1860’s! Visitors will get a taste of the cool and pleasant summer beverage while learning the process of brewing. The ginger beer brewing process uses an original Victorian ginger beer recipe which will be available for guests to take home to practice brewing their own batch. Ginger beer is a soft drink that originated in Yorkshire, England, in the mid-18th century and was introduced in the United States in the mid-19th century. Ginger beer is made by mixing ginger, cream of tartar, sugar, boiling water, lemon juice and yeast. Once all the ingredients are combined, the mixture will ferment over a few days, turning it into ginger beer, an excellent beverage with a fine flavor to savor on a hot summer day. 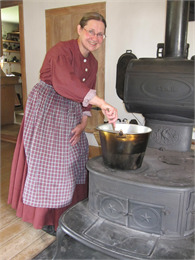 Wade House, an 1850s stagecoach inn built to serve traffic along the plank road that connected Fond du Lac and Sheboygan, tells the story of frontier entrepreneur Sylvanus Wade and his family during the Civil War years. In addition to the inn, the historic site includes the recently reconstructed Herrling sawmill, one of the few working, water-powered sawmills of its kind in the nation. Wade House is also home to the Wesley Jung Carriage Museum, which houses the state's largest collection of antique carriages and working wagons.